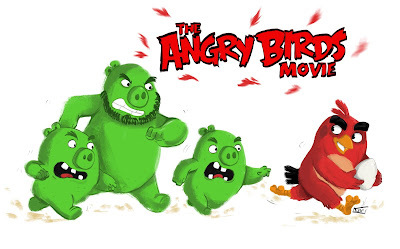 Karitoonz: The Angry Birds Movie is out Today!!! Three years ago I had finished up my internship at Disney Animation and was returning back to school without any idea what I was going to do after I finished my last semester. God's timing was perfect and that fall I was contacted by Clay (one of the directors on Angry Birds whom I had met while at Disney) and offered a job as a jr. story artist on the Angry Birds Movie, and the rest is history! I am so thankful to have been given the opportunity to work with such an awesome and talented crew, and being able to learn and grow as a person and an artist. Thank you again Clay and Fergal for taking a chance on me and allowing me to grow as a story artist. Congratulations to the Angry Birds crew for creating such an awesome movie, and I am so honored to have been able to be a part of the journey. GO SEE DA MOVIE!smile emoticoGO SEE DA MOVIE!